It's Always Something With Her...: Seattle Snow!! Last night Punkin had a school concert in downtown Seattle. It's fun to see all the kids sing their songs. The younger kids seem so little that it's hard to believe Punkin was ever that age. The last number was Singin' in the Rain by Punkin's grade. At the end some of them did a little umbrella dance on stage with those big golf umbrellas and the rest of them went out into the aisles and had umbrella hats and did a little dance there. Anyway, after we collected our child, we started out only to find that it was snowing! It really doesn't snow here much at all and it's pretty late in the season for snow. But there it was. Big, huge flakes coming down pretty heavy. I managed to catch a few on my tongue, much to the embarrassment of the Punkin. 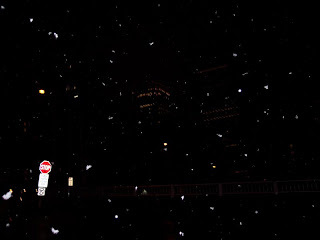 I attempted to catch some photos of the snow, but my battery was super low and by the time I found a setting that wouldn't make the flash go off, the camera was dead. 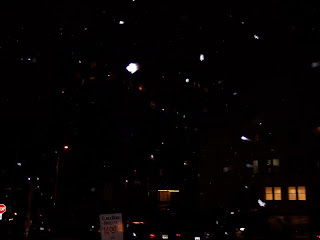 So, I got 2 really bad shots, but as you can see, the big fluffy flakes are pretty visible in them anyway. The snow didn't last long, but it sure was perty while it was around. All the kids and even at least one teacher were hoping that there wouldn't be school today, but that wasn't going to happen.